San Salvador, El Salvador, greeted us with warm weather and sunshine. Great to have a nap at the hotel’s pool. The friendly staff provided us with coconut-pineapple-mango juice non stop. After three espressos on top our promoter team picked us up to take us to the venue. We knew it would be hot, but that gig was one big sauna! Two very friendly police officers paid us a visit, however, not to tell us about restrictions; they were interested in Joris’ blast beat drumming and life on the road, moreover, life in Europe. 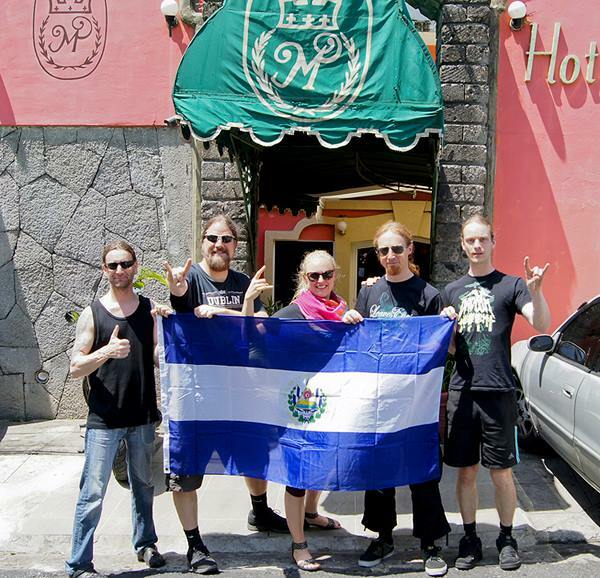 We were very happy to meet & greet out metal audience in El Salvador for the first time. In the backyard of the venue the mangoes were falling down every 2 minutes as we were taking photos and doing signings every. I wish this sweet, awesome fruit would grow in my own garden!